Without doubt, 2007's 'Different Shapes,' had to be DGM's best work to that time, receiving rave reviews around the world. They easily merged the complexity of progressive metal with the strength and energy of power metal to create a satisfying sonic masterpiece. Therefore, the obvious question is, How do they top that? And, more importantly, how do they top that work when long time vocalist Titta Tani bails due to personnel differences? Simple: DGM recruits vocal dynamo Mark Basile (Mind Key) and picks up where it left off, hardly skipping a beat. As a whole, 'Frame' moves along at an ambitious pace with little respite and few flaws. If there are any bumps along the road, it is when DGM seems to err on pushing more power than prog metal as on 'Hereafter,' 'Heartache,' or 'Rest In Peace.' But this is hardly cause for discomfort or dismay. 'Frame' is another satisfying accomplishment from DGM, a band at the peak of their career. DGM's 'Frame' is filled with strong, steady and epic movements of power/prog metal that rush at you like a herd of thundering buffalo. As a whole, it moves along at an ambitious pace with little respite and few flaws. 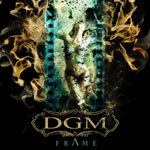 'Frame' is another satisfying accomplishment from DGM, a band at the peak of their career.